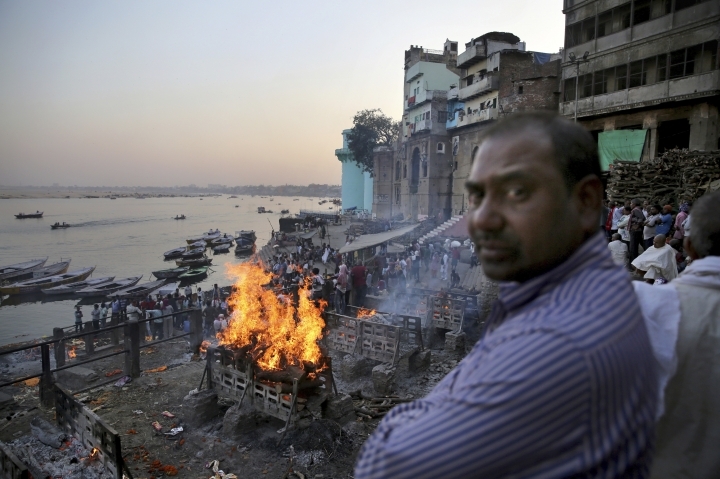 VARANASI, India — In the Indian city Hindus consider the center of the world, Prime Minister Narendra Modi has commissioned a grand promenade connecting the sacred Ganges River with the centuries-old Vishwanath temple dedicated to Lord Shiva, the god of destruction. It's a project dripping with equal parts symbolism — Modi, the devout Hindu, restoring the ancient connection between two religious icons — and political calculation. In his five years as prime minister, Modi has pushed to promote this secular nation of 1.3 billion people and nine major religions — including about 170 million Muslims — as a distinctly Hindu state. The $115 million promenade is just one of a number of Modi's religious glamour projects, aimed squarely at pleasing his Hindu nationalist Bharatiya Janata Party's base ahead of a general election that starts on Thursday. While India is majority Hindu, critics say such projects undermine India's multiculturalism, potentially stoke religious tension, and come at the expense of far more pressing infrastructure needs. The project is also part of a larger Hindu nationalist effort to erase evidence of India's diverse past. 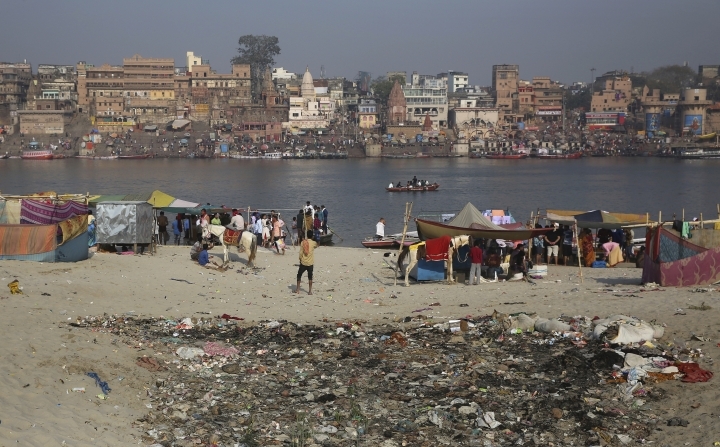 There are those who say the money could have been better spent in one of the world's oldest living cities, where men relieve themselves in public on trash-strewn streets and sewage flows into the Ganges near religious bathers, funeral pyres and crowds of devotees who gather by its waters for nightly prayers. 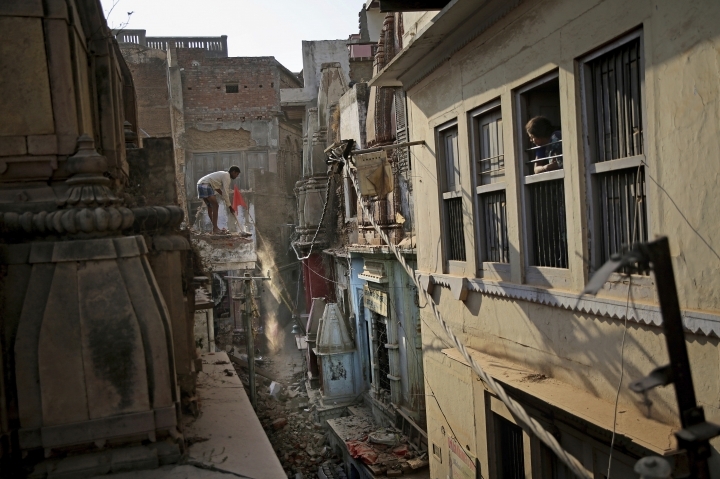 The demolition of around 300 commercial and residential buildings to make way for the promenade has left a gaping hole in Varanasi's urban core, a congested maze of zig-zagging brick lanes full of religious shrines. 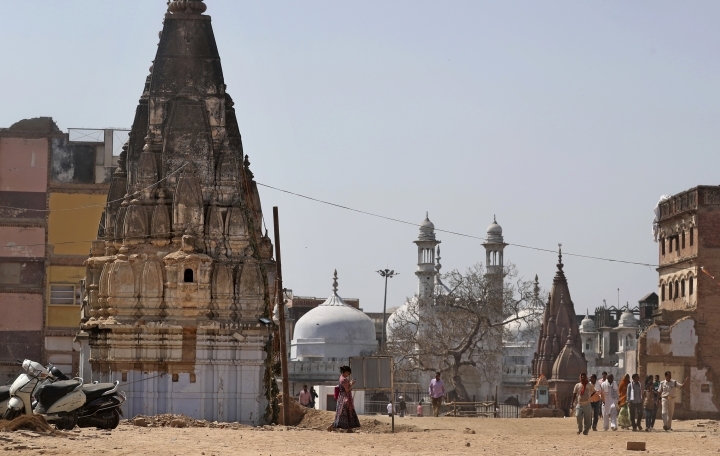 Outside the heavily guarded temple and mosque complex ringed with barbed wire, where photography is prohibited, Aijaz Mohammed Islahi, the mosque's caretaker, said he fears the new clearing could allow right-wing Hindus to form a mob and attack the mosque. Around a Hindu festival day in March, Islahi said, a group tried to install a Hindu statue near the mosque to assert a claim on the property. "They thought they would quietly garland the statue and people will accept the change after a couple of days," he said. The Vishwanath project is part of a broader campaign to downplay the Muslim Mughal dynasty's place in Indian history. The campaign includes restoring the Hindu names of cities that were renamed by Mughals centuries ago and excluding the Taj Mahal, a Muslim tomb, from government tourism materials. 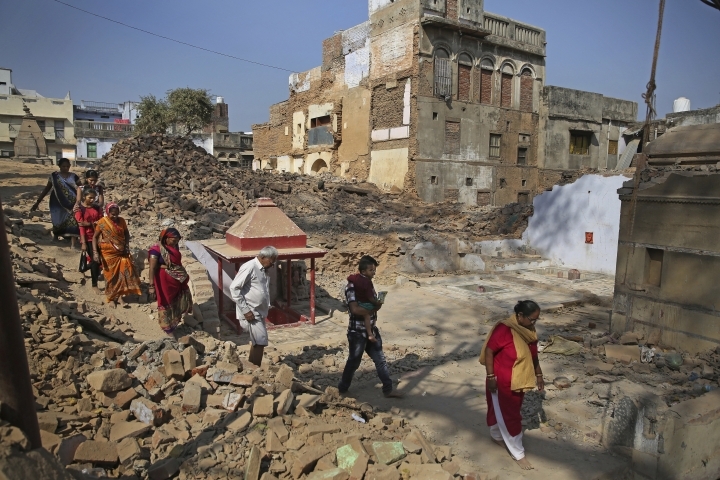 At the same time, Hindu nationalists are demanding that a temple to the god Lord Ram be built at the site of a mosque rioters destroyed in 1992 that they say was built only after Muslims destroyed an ancient temple there. 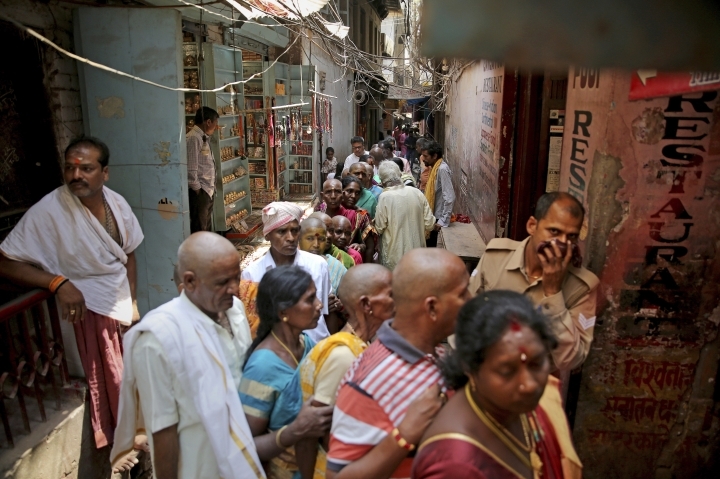 Thus, Modi's messaging around the Vishwanath temple project is hard to miss. "Enemies had their sight on Shri Kashi Vishwanath. Many a times it was under attack," Modi said at a promenade groundbreaking ceremony in March. "But there is power in the faith here and this great temple continues to give strength to people." Deepak Agarwal, the city commissioner overseeing the Vishwanath project, said that residents had been paid at least twice the market rate for their properties and that no one had been forced to leave. 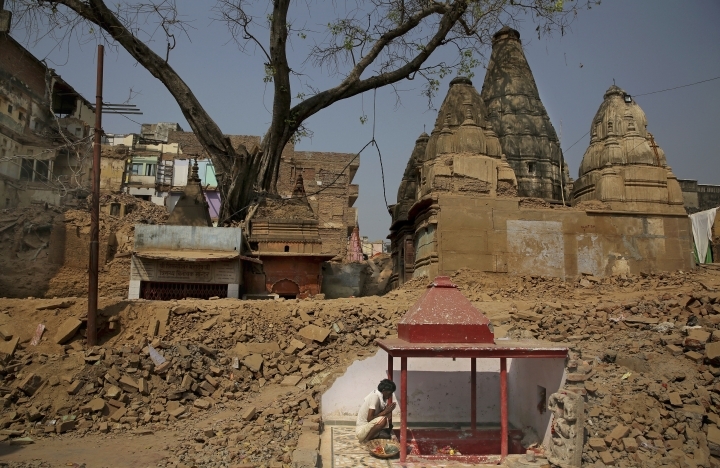 Modi's directive was "to restore the glory back to this area," Agarwal said, including rehabilitating about 40 Hindu temples or shrines uncovered in the demolition, and investing in public amenities. 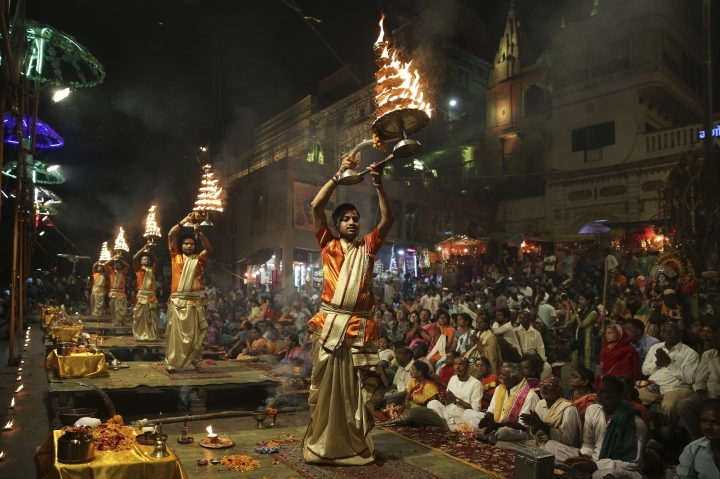 Though Varanasi draws millions of devout Hindus each year, scholars and residents emphasize its identity as a city where people of many faiths have long lived together harmoniously. But the temple project is a BJP-led effort to stamp India's Hindu mores onto a multicultural society, historians and political scientists say. "It's a bid to rewrite the ground rules of Indian republican politics by either implicitly or explicitly arguing that India needs to be remade as a state defined by its majority faith," said writer and professor Mukul Kesavan. Other examples abound. Last October, Modi unveiled another dream project: a statue in Gujarat of Sardar Vallabhbhai Patel, an Indian independence leader, politician and Hindu. The Statue of Unity is the world's largest, almost twice as high as the Statue of Liberty. And in January, the central government in New Delhi and the BJP-led government of Uttar Pradesh state spent an unprecedented $650 million on a Hindu mega-fest, advertising the event on CNN and plastering the festival grounds with posters of Modi and the state's chief minister, Yogi Adityanath, a Hindu monk who was arrested but not prosecuted for allegedly inciting a deadly 2007 anti-Muslim riot. 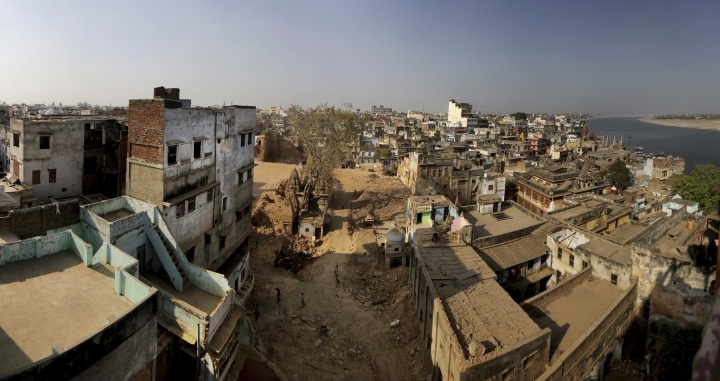 Modi's BJP took power in 2014 elections on a pledge to rapidly expand India's economy. A master marketer, Modi has branded some government programs as personal successes — constructing millions of toilets to reduce open defecation, and improving roads and electricity in rural areas — while distancing himself from failures. But in the lead-up to the polls, his government's economic performance has come under scrutiny. Modi's administration was accused in January of suppressing unemployment data that showed joblessness had reached its highest level in 45 years. A demonetization program aimed to curb black market money by taking some rupee notes out of circulation. But it ultimately hurt the poor, and India's central bank later said that most of the illicit funds had re-entered the banking system. Public subsidies to support India's distressed agricultural sector failed to stem a pattern of suicides among farmers facing mounting debt for purchases of seeds, fertilizer and cattle feed. 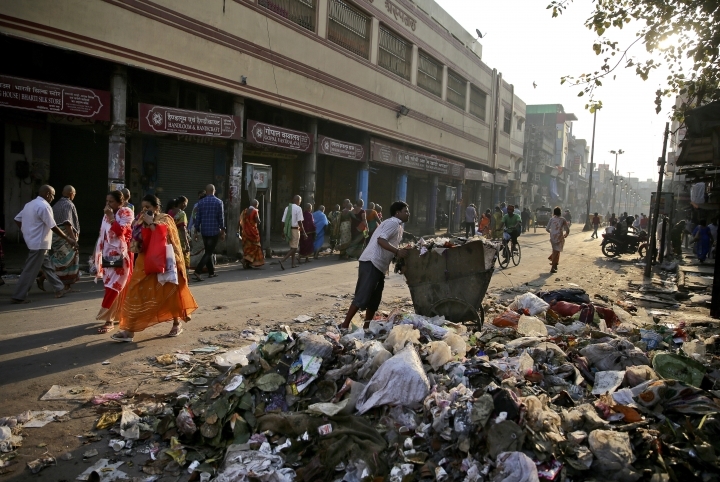 Even in Modi's constituency of Varanasi, the government's record is uneven, most visibly on the prime minister's signature Swachh Bharat, or Clean India, program. But with the Vishwanath temple and other symbolic projects, one of Modi's undisputed successes has been to insert religion into the center of the political debate in India. Even leaders of the opposition Congress party, which has stood for secularism since before India's independence, are trying to prove their Hindu credibility. Priyanka Gandhi, sister of Congress party leader Rahul Gandhi, spent three days in March traveling by boat on the Ganges, a trip billed as a "yatra," or religious journey, that culminated with a visit to the Vishwanath temple in Varanasi. Yet criticizing Modi's development projects, she said that "the prime minister should stop thinking that people are fools," and "should understand that they see through this," arguing that the prime minister's showmanship lacks substance. 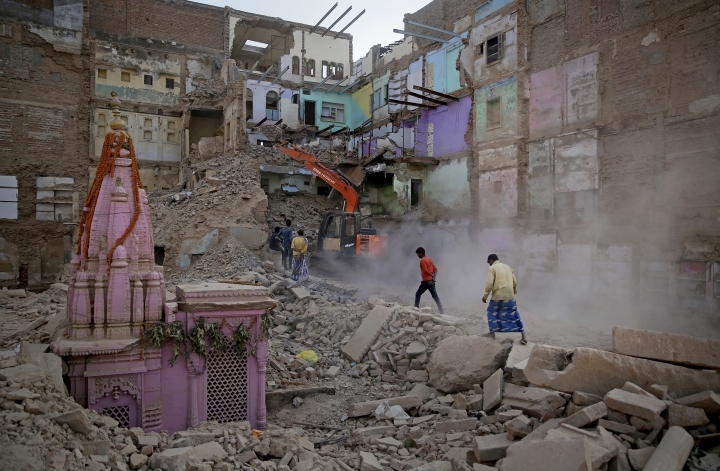 In the demolition zone, Sonu Khanna sits cross-legged amid stacks of pashmina shawls and silk saris. Khanna and his siblings, parents and grandfather live and run a wholesale garment business near the Vishwanath temple that deeds on weathered paper show the family has owned since Mughal times. If the government offers them cash to move, the Khannas, practicing Hindus, will probably join most of their neighbors uprooted in Modi's dream project. But Modi won't have won their votes. 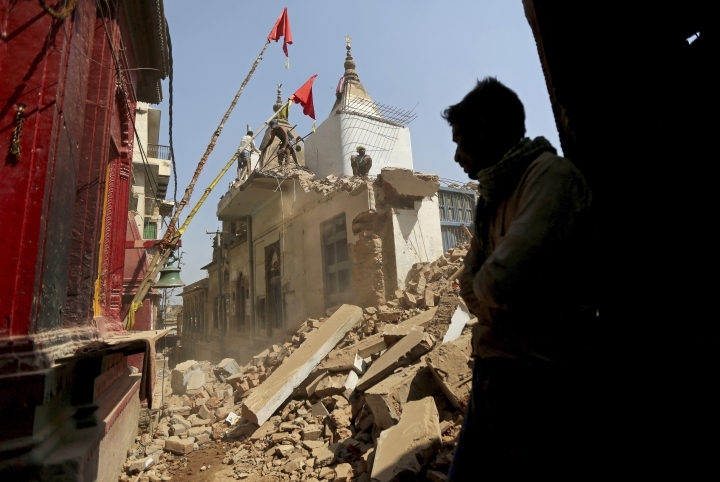 "Friends and family used to live all around us, and now we're alone in all this dust and noise," 25-year-old Khanna said.